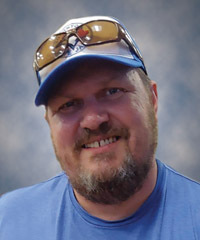 We are heartbroken to announce the sudden death of Kurt Lindstrom on March 4, 2019 at the age of 45 years. Kurt was an amazing person and was the most kind, honest, funny, happy go lucky man who loved his family and friends fiercely. He had such good friends and will forever be remembered. Born in Edmonton but raised in Medicine Hat, Kurt graduated from Crescent Heights High School in Medicine Hat in 1991. Everyone he interacted with online or in person always loved his infectious attitude. Kurt’s smile always lit up the room, he could always make you feel better if you were down. He was fiercely loyal to people he cared about, and he lived life to the fullest every day. Kurt was proud of the work he did as a carpet cleaner for 16 years and excited to start a new career in Carpentry. He loved all sports, especially hockey, soccer and baseball. When one season ended a new one always began. You could always count on Kurt to have the newest statistics and scores. Kurt is survived by his wife, Mercy-Anne; children, Hannah, Blaize, Coltan, Arianna, Paterick, Kacey, Cameron, Tanis, Raistlin, and Zoey-Anne; two grandchildren, Echo and Harlynn; parents, Marion Erikson, Clarence Erikson and Wayne Lindstrom; grandma, Olga Chambers; brothers, Shon (France) Lindstrom and Cory (Amie) Lindstrom; sisters, Tara (Jerry) Bitschy and Anna (Kelvin Tessmer) Bugnet; as well as numerous aunts, uncles, nieces and nephews. Predeceased by his grandpa, Harold Chambers. He was loved by all who met him and will be greatly missed. Our family is eternally grateful to all who reached out to us during this difficult time. Funeral Service Wednesday, March 13 at 3:30 p.m. at Park Memorial Chapel, 9709 – 111 Avenue, Edmonton. Friends and family may pay their respects two hours prior to the service. Cremation will take place following the service. His friends have started a GOFUNDME.com page on Facebook, please refer to this instead of sending flowers or donations. Photos, memories and condolences maybe shared through www.parkmemorial.com.